On Saturday, despite the heavy rain, we made another excursion to Grace Garden in Odenton for some really good Chinese food. Considering the restaurant had recently been named Best Chinese by the Baltimore City Paper, there was only one table occupied and a couple of people waiting for carry-out orders when we arrived at about 5:45 PM. When we left, nearly two hours later, there were just as many (or, as few) diners as when we got there. Don't know if it was the rain, or the location, but secretly I was happy to see that the restaurant wasn't already taken-over by more city-folk like me. I know, selfish. Bad me. MinxBrother joined Mr Minx, LaRaine, and myself this time, and he requested that I order the tea smoked duck again so he could try it. I happily obliged, because it was probably the favorite dish I had last time we ate at Grace Garden. Once at the restaurant, we ordered five more dishes that we had not yet tried. 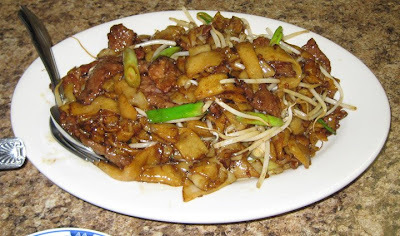 This was the beef chow fun, and probably my least favorite dish of the evening. It was heavy on the beef and light on the starch, which might be a good thing for some, but the chewy rice noodles are my favorite part of this dish. It was also a bit on the greasy side. Here we have fish noodles - noodles made from actual ground fish, stirfried with mushrooms and Chinese sausage. The dish also contains cilantro, which we asked for on the side because Ms LaRaine is allergic (tragic, I know). Having seen many an Iron Chef episode in which Chen or Morimoto combined fish and egg whites in a food processor and then squeezed it into boiling broth, we were all curious to experience this dish for ourselves. It scored high on our list - it was very subtle, the "noodles" having a texture not unlike very tender chicken breast strips (you know, cooked Chinese style so they almost melt in the mouth) and were not at all fishy-tasting. The sauce was barely there, delicate and velvety, binding the elements together into a flavorful whole. I'd order this one again and again. 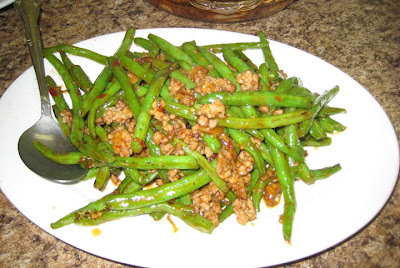 I thought we should have a vegetable and ordered Sichuan string beans from the "regular" menu. Not as garlicky as some I've eaten before, these were nevertheless delicious and generously dosed with ground pork that had been sauteed in savory Sichuan sauce. I could have eaten a plate of just the meat bits. They'd make a fantastic Chinese "sloppy Joe" - I have to remember to pick up a can of Sichuan sauce at the Han Ah Reum next time we go shopping to try that for myself. LaRaine was curious to try the Sichuan dish listed as possessing "ma-la" or the tongue-numbing qualities of Sichuan peppercorns in a sauce also hot with chile oil. The rest of us worried slightly that it might be too hot for our fairly wimpy Western palates, but that was for naught. 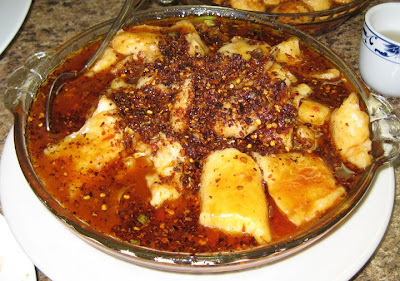 The chunks of very mild fish that had been coated with ground peppercorns were hotter than the chunks that were not, but overall the table considered the dish to be "medium-spicy." 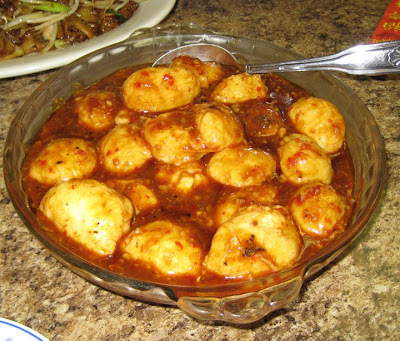 I find the hot chile oil I like to use while eating dim sum to be hotter than this dish. Overall, though, the flavor was nice and I'm glad we tried it. Finally, we ordered the misnamed "pocket tofu" which leads one to believe the dish is comprised of pieces of tofu with a pocket cut into it, stuffed with shrimp mousse. What it is in actuality is a combination of homemade tofu mixed with shrimp mousse, the mixture appearing to be scooped (literally, with an ice cream scoop) into liquid for braising. We ordered the hot bean paste sauce version, and it was only lightly spicy. The tofu mixture itself was light and fluffy and reminded MinxBro of fresh mozzarella. It was very good, if not quite what we expected. I would say our second visit to Grace Garden was as successful as our first, and we definitely need to schedule a third trip sometime soon. I'd like to try the hot and spicy smoky shrimp, the salt and pepper squid, crispy Sichuan fish with rice powder, wok fried quail, the Hak-ka style tofu - oh heck, I want to try everything on the menu! Have you been yet? No? What are you waiting for?